Citation Information: J Clin Invest. 2004;114(5):601-601. https://doi.org/10.1172/JCI120006. Want the world to know? Publish here. Citation Information: J Clin Invest. 2004;114(5):602-602. https://doi.org/10.1172/JCI22905. Recent recommendations by the governments of the United Kingdom and the United States support the notion that government-funded research should be published in free-access journals. The JCI supports these recommendations, and we remind our readers that all JCI articles are deposited in PubMed Central for completely free access from the day they are published. Citation Information: J Clin Invest. 2004;114(5):603-603. https://doi.org/10.1172/JCI22908. Citation Information: J Clin Invest. 2004;114(5):604-604. https://doi.org/10.1172/JCI22882. Citation Information: J Clin Invest. 2004;114(5):611-613. https://doi.org/10.1172/JCI22669. Glomerular filtration in the kidney is a continuous process that acts in concert with tubular reabsorption to prevent derangements of body fluid composition. Filtration is regulated by systemic factors, but it is also controlled by an intrinsic mechanism based on the anatomical connection between the distal nephron and the glomerular arterioles. Facing the threat of urinary salt loss, this mechanism causes vasoconstriction and reduces filtration by generating adenosine through the hydrolysis of nucleotide precursors such as 5′-AMP and possibly ATP . Why does diabetes increase atherosclerosis? I don’t know! Citation Information: J Clin Invest. 2004;114(5):613-615. https://doi.org/10.1172/JCI22826. There is a wealth of clinical data showing the relationship between diabetes mellitus and atherosclerosis and its clinical complications. To dissect this relationship, investigators have attempted, usually unsuccessfully, to create a small-animal model in which diabetes accelerates vascular lesion development. This effort has often been complicated by development of hyperlipidemia leading to difficulty in differentiating the effects of hyperglycemia from those of lipid abnormalities. A study in the current issue of the JCI provides data on a new mouse model in which atherosclerosis initiation is accelerated in diabetic mice and is reduced by insulin therapy. Moreover, these animals have greater intra-arterial hemorrhage, which might be due to less stable plaques . Citation Information: J Clin Invest. 2004;114(5):616-619. https://doi.org/10.1172/JCI22820. Patients with systemic lupus erythematosus (SLE) often develop glomerulonephritis (i.e., inflammation in the glomeruli of the kidney), commonly referred to as lupus nephritis. Patients with lupus nephritis typically have autoantibodies to the complement classical pathway protein C1q. Whether these anti-C1q antibodies play any role in the development of lupus nephritis has been unclear. 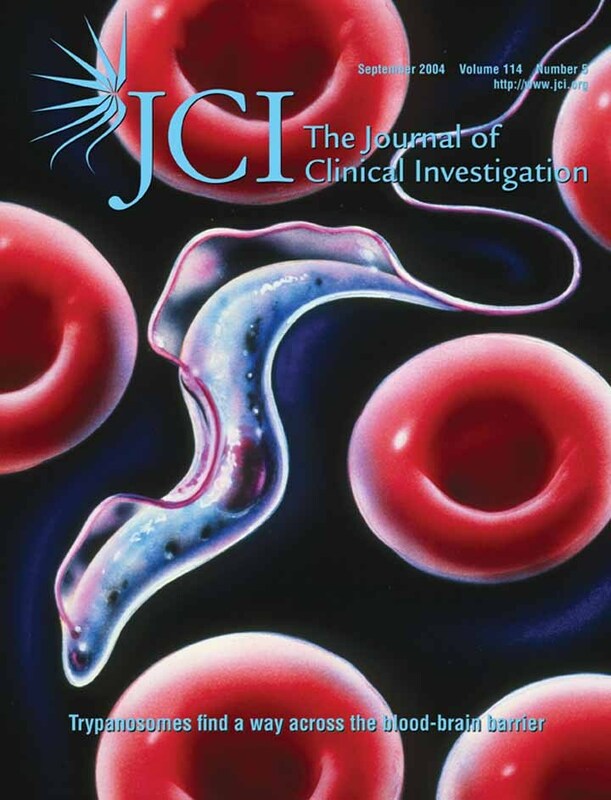 In this issue of the JCI, a new study demonstrates that anti-C1q antibodies can amplify glomerular injury but only when they are bound within the glomerulus to C1q that has been already brought to that site by other types of glomerular-reactive autoantibodies . These studies are the first, to our knowledge, to provide a causal link between anti-C1q antibodies and target organ damage in SLE. Citation Information: J Clin Invest. 2004;114(5):619-622. https://doi.org/10.1172/JCI22800. Signal transducer and activator of transcription 3 (Stat3) is a transcription factor that is constitutively activated in a variety of human malignancies, including prostate, lung, brain, breast, and squamous cell carcinomas. Inhibition of activated Stat3 leads to decreased proliferation and apoptosis of many cancer-derived cell lines, while the introduction of a constitutively activated form of Stat3 into immortalized human breast epithelial cells and rodent fibroblasts results in cellular transformation. Collectively, these data suggest a role for Stat3 in oncogenesis. A new study from Chan et al. (see related article beginning on page 720) is the first to demonstrate a requirement for Stat3 in de novo epithelial carcinogenesis in vivo. Using the two-step model of chemically induced skin carcinogenesis, the authors demonstrated that mice deficient in Stat3 were completely resistant to skin tumor development. Citation Information: J Clin Invest. 2004;114(5):623-633. https://doi.org/10.1172/JCI22087. A mouse model involving the human papillomavirus type-16 oncogenes develops cervical cancers by lesional stages analogous to those in humans. In this study the angiogenic phenotype was characterized, revealing intense angiogenesis in high-grade cervical intraepithelial neoplasias (CIN-3) and carcinomas. MMP-9, a proangiogenic protease implicated in mobilization of VEGF, appeared in the stroma concomitant with the angiogenic switch, expressed by infiltrating macrophages, similar to what has been observed in humans. Preclinical trials sought to target MMP-9 and angiogenesis with a prototypical MMP inhibitor and with a bisphosphonate, zoledronic acid (ZA), revealing both to be antiangiogenic, producing effects comparable to a Mmp9 gene KO in impairing angiogenic switching, progression of premalignant lesions, and tumor growth. ZA therapy increased neoplastic epithelial and endothelial cell apoptosis without affecting hyperproliferation, indicating that ZA was not antimitotic. The analyses implicated cellular and molecular targets of ZA’s actions: ZA suppressed MMP-9 expression by infiltrating macrophages and inhibited metalloprotease activity, reducing association of VEGF with its receptor on angiogenic endothelial cells. Given its track record in clinical use with limited toxicity, ZA holds promise as an “unconventional” MMP-9 inhibitor for antiangiogenic therapy of cervical cancer and potentially for additional cancers and other diseases where MMP-9 expression by infiltrating macrophages is evident. Citation Information: J Clin Invest. 2004;114(5):652-658. https://doi.org/10.1172/JCI21737. The action of insulin in the central nervous system produces sympathetic nervous system activation (also called sympathoactivation), although the neuronal intracellular mechanisms that mediate this are unclear. We hypothesized that PI3K and MAPK, the major pathways involved in insulin receptor signaling, mediate sympathetic nerve responses to insulin. Intracerebroventricular administration of insulin in rat increased multifiber sympathetic nerve activity to the hindlimb, brown adipose tissue (BAT), adrenal gland, and kidney. Ex vivo biochemical studies of mediobasal hypothalamic tissue revealed that insulin stimulated the association of insulin receptor substrate–1 with the p85α subunit of PI3K and also tyrosine phosphorylation of p42 and p44 subunits of MAPK in the hypothalamus. In order to determine whether PI3K and/or MAPK were involved in insulin-mediated sympathoactivation, we tested the effect of specific inhibitors of PI3K (LY294002 and wortmannin) and MAPK (PD98059 and U0126) on regional sympathetic responses to insulin. Interestingly, regional sympathoactivation to insulin was differentially affected by blockade of PI3K and MAPK. Inhibition of PI3K specifically blocked insulin-induced sympathoactivation to the hindlimb, while inhibition of MAPK specifically blocked insulin-induced sympathoactivation to BAT. Sympathoactivation to corticotrophin-releasing factor, however, was not affected by inhibition of PI3K and MAPK. These data demonstrate that PI3K and MAPK are specific and regionally selective mediators of the action of insulin on the sympathetic nervous system. Citation Information: J Clin Invest. 2004;114(5):659-668. https://doi.org/10.1172/JCI17867. Diabetes in humans accelerates cardiovascular disease caused by atherosclerosis. The relative contributions of hyperglycemia and dyslipidemia to atherosclerosis in patients with diabetes are not clear, largely because there is a lack of suitable animal models. We therefore have developed a transgenic mouse model that closely mimics atherosclerosis in humans with type 1 diabetes by breeding low-density lipoprotein receptor–deficient mice with transgenic mice in which type 1 diabetes can be induced at will. These mice express a viral protein under control of the insulin promoter and, when infected by the virus, develop an autoimmune attack on the insulin-producing β cells and subsequently develop type 1 diabetes. When these mice are fed a cholesterol-free diet, diabetes, in the absence of associated lipid abnormalities, causes both accelerated lesion initiation and increased arterial macrophage accumulation. When diabetic mice are fed cholesterol-rich diets, on the other hand, they develop severe hypertriglyceridemia and advanced lesions, characterized by extensive intralesional hemorrhage. This progression to advanced lesions is largely dependent on diabetes-induced dyslipidemia, because hyperlipidemic diabetic and nondiabetic mice with similar plasma cholesterol levels show a similar extent of atherosclerosis. Thus, diabetes and diabetes-associated lipid abnormalities have distinct effects on initiation and progression of atherosclerotic lesions. Citation Information: J Clin Invest. 2004;114(5):679-688. https://doi.org/10.1172/JCI21075. Anti-C1q autoantibodies are present in sera of patients with several autoimmune diseases, including systemic lupus erythematosus (SLE). Strikingly, in SLE the presence of anti-C1q is associated with the occurrence of nephritis. We have generated mouse anti–mouse C1q mAb’s and used murine models to investigate whether anti-C1q autoantibodies actually contribute to renal pathology in glomerular immune complex disease. Administration of anti-C1q mAb JL-1, which recognizes the collagen-like region of C1q, resulted in glomerular deposition of C1q and anti-C1q autoantibodies and mild granulocyte influx, but no overt renal damage. However, combination of JL-1 with a subnephritogenic dose of C1q-fixing anti–glomerular basement membrane (anti-GBM) antibodies enhanced renal damage characterized by persistently increased levels of infiltrating granulocytes, major histological changes, and increased albuminuria. This was not observed when a non–C1q-fixing anti-GBM preparation was used. Experiments with different knockout mice showed that renal damage was dependent not only on glomerular C1q and complement activation but also on Fcγ receptors. In conclusion, anti-C1q autoantibodies deposit in glomeruli together with C1q but induce overt renal disease only in the context of glomerular immune complex disease. This provides an explanation why anti-C1q antibodies are especially pathogenic in patients with SLE. Citation Information: J Clin Invest. 2004;114(5):701-712. https://doi.org/10.1172/JCI21593. Hepatic immunobiology is paradoxical: although the liver possesses unusual tolerogenic properties, it is also the site of effective immune responses against multiple pathogens and subject to immune-mediated pathology. The mechanisms underlying this dichotomy remain unclear. Following previous work demonstrating that the liver may act as a site of primary T cell activation, we demonstrate here that the balance between immunity and tolerance in this organ is established by competition for primary activation of CD8+ T cells between the liver and secondary lymphoid tissues, with the immune outcome determined by the initial site of activation. Using a transgenic mouse model in which antigen is expressed within both liver and lymph nodes, we show that while naive CD8+ T cells activated within the lymph nodes were capable of mediating hepatitis, cells undergoing primary activation within the liver exhibited defective cytotoxic function and shortened half-life and did not mediate hepatocellular injury. The implications of these novel findings may pertain not only to the normal maintenance of peripheral tolerance, but also to hepatic allograft tolerance and the immunopathogenesis of chronic viral hepatitis. Citation Information: J Clin Invest. 2004;114(5):713-719. https://doi.org/10.1172/JCI21716. Myelodysplasia is a hematological disease in which genomic abnormalities accumulate in a hematopoietic stem cell leading to severe pancytopenia, multilineage differentiation impairment, and bone marrow (BM) apoptosis. Mortality in the disease results from pancytopenia or transformation to acute myeloid leukemia. There are frequent cytogenetic abnormalities, including deletions of chromosomes 5, 7, or both. Recurring chromosomal translocations in myelodysplasia are rare, but the most frequent are the t(3;3)(q21;q26) and the inv(3)(q21q26), which lead to the inappropriate activation of the EVI1 gene located at 3q26. To better understand the role of EVI1 in this disease, we have generated a murine model of EVI1-positive myelodysplasia by BM infection and transplantation. We find that EVI1 induces a fatal disease of several stages that is characterized by severe pancytopenia. The disease does not progress to acute myeloid leukemia. Comparison of in vitro and in vivo results suggests that EVI1 acts at two levels. The immediate effects of EVI1 are hyperproliferation of BM cells and downregulation of EpoR and c-Mpl, which are important for terminal erythroid differentiation and platelet formation. These defects are not fatal, and the mice survive for about 10 months with compensated hematopoiesis. Over this time, compensation fails, and the mice succumb to fatal peripheral cytopenia. Citation Information: J Clin Invest. 2004;114(5):720-728. https://doi.org/10.1172/JCI21032. Constitutive activation of signal transducer and activator of transcription 3 (Stat3) has been found in a wide spectrum of human malignancies. Here, we have assessed the effect of Stat3 deficiency on skin tumor development using the 2-stage chemical carcinogenesis model. The epidermis of Stat3-deficient mice showed a significantly reduced proliferative response following treatment with the tumor promoter 12-O-tetradecanoylphorbol-13-acetate (TPA) because of a defect in G1-to-S-phase cell cycle progression. Treatment with the tumor initiator 7,12-dimethylbenz[a]anthracene (DMBA) resulted in a significant increase in the number of keratinocyte stem cells undergoing apoptosis in the bulge region of hair follicles of Stat3-deficient mice compared with nontransgenic littermates. Notably, Stat3-deficient mice were completely resistant to skin tumor development when DMBA was used as the initiator and TPA as the promoter. Abrogation of Stat3 function using a decoy oligonucleotide inhibited the growth of initiated keratinocytes possessing an activated Ha-ras gene, both in vitro and in vivo. In addition, injection of Stat3 decoy into skin tumors inhibited their growth. To our knowledge, these data provide the first evidence that Stat3 is required for de novo epithelial carcinogenesis, through maintaining the survival of DNA-damaged stem cells and through mediating and maintaining the proliferation necessary for clonal expansion of initiated cells during tumor promotion. Collectively, these data suggest that, in addition to its emerging role as a target for cancer therapy, Stat3 may also be a target for cancer prevention strategies. Citation Information: J Clin Invest. 2004;114(5):729-738. https://doi.org/10.1172/JCI21231. Junctional adhesion molecule-A (JAM-A) is a transmembrane adhesive protein expressed at endothelial junctions and in leukocytes. In the present work, we found that DCs also express JAM-A. To evaluate the biological relevance of this observation, Jam-A–/– mice were generated and the functional behavior of DCs in vitro and in vivo was studied. In vitro, Jam-A–/– DCs showed a selective increase in random motility and in the capacity to transmigrate across lymphatic endothelial cells. In vivo, Jam-A–/– mice showed enhanced DC migration to lymph nodes, which was not observed in mice with endothelium-restricted deficiency of the protein. Furthermore, increased DC migration to lymph nodes was associated with enhanced contact hypersensitivity (CHS). Adoptive transfer experiments showed that JAM-A–deficient DCs elicited increased CHS in Jam-A+/+ mice, further supporting the concept of a DC-specific effect. Thus, we identified here a novel, non-redundant role of JAM-A in controlling DC motility, trafficking to lymph nodes, and activation of specific immunity. Citation Information: J Clin Invest. 2004;114(5):739-739. https://doi.org/10.1172/JCI19855C1.